In December 2015 the regrowth works of the Cambambe hydroelectric power station, in the Kwanza River, about 180 kilometres southeast of Luanda, the capital of Angola, will be concluded. This dam currently supplies power to the cities of Luanda, Ndalatando, Cacuaco, Malanje, Gabela, Porto Amboim and Sumbe, benefiting a population of approximately 8 million people. Built in 1962, the station is being renovated and expanded since 2009 to increase its energy production by 80%. From the current 180 MW per year, this infrastructure will then produce 960 MW, becoming the largest power production plant of the Kwanza basin. In 2014, Cambambe was certified with ISO 9001, 14001 and 18001 seals, being the first hydroelectric project in Africa to obtain such recognition. Part of the project which is being conducted by the Brazilian construction company Norberto Odebrecht is the rise of the dam’s height by 20 metres. This heightening will increase the capacity of the reservoir from 2 to 5.5 km2, and allow the four existing generators to produce 65 megawatts each instead of the present 45. 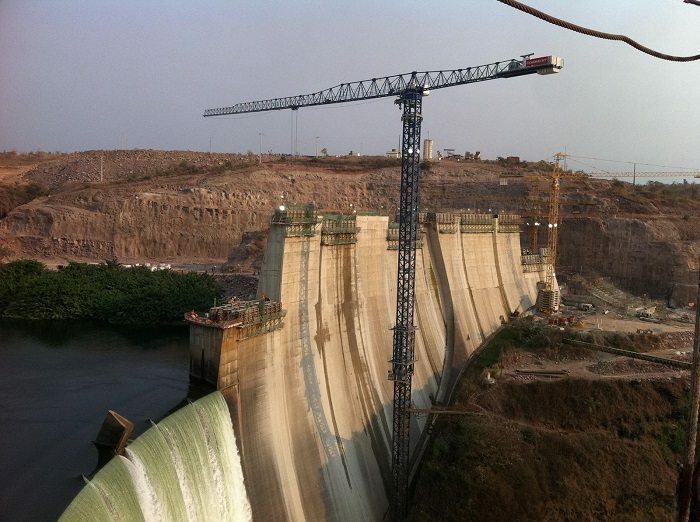 In order to put into place the over 65,000 cubic metres of concrete needed to rise the dam, Odebrecht counts on the help of three Linden Comansa tower cranes: two 21LC750 with maximum load capacity of 48 tonnes acquired in 2012 and a 21LC400 with maximum capacity of 18 tonnes leased by IBERGRU, the exclusive distributor of Linden Comansa in Angola. The first 21LC750 was located on the left bank of the Kwanza River, erected with fixing angles on a special concrete foundation which, given its short width, was anchored to a rock on the river bank. It was mounted with a freestanding height of 78.8 metres, the maximum possible height with 2.5-metre-wide mast sections (fourteen D36 sections), and a jib length of 80 metres. On the right bank, a second 21LC750 was erected with a freestanding height of 87.2 metres, achieved with 12 sections D36 – as her “sister” in the left margin – increased by three 5-metre-wide D56 sections at its bottom. Another concrete foundation was anchored on the riverside to allow this crane’s assembly on fixing angles. After a year and a half working in concreting and materials lifting tasks, the first 21LC750 (left bank) was relocated within the jobsite and substituted by a 21LC400 from IBERGRU’s rental fleet, which was erected with a freestanding height of 80 metres and a jib length of 70 metres. This crane was assembled on the same fixing angles of the previous 21LC750, so it was necessary to have two transition sections in order to allow the progression from the 4 metre-wide fixing angles to the 2.5-metre-wide D33 mast section. The relocated 21LC750 is currently working on the construction of the power house (or power generation centre) where it was assigned to moving precast segments up to 19 tonnes of weight for the new water tunnels, as well as lifting and placing all the electromechanical gear that will allow the production of energy, such as turbines and generator sets. The assembly and jacking-up of the first 21LC750 was performed by Linden Comansa’s technical assistance service team, while the remaining assemblies, jacking-ups and technical service was entrusted to IBERGRU. IBERGRU is the official distributor of Linden Comansa in Portugal since 2002. In 2008, the company opened offices in Angola, where it offers its tower crane rental services as well as technical planning and coordination for all kinds of lifting projects.